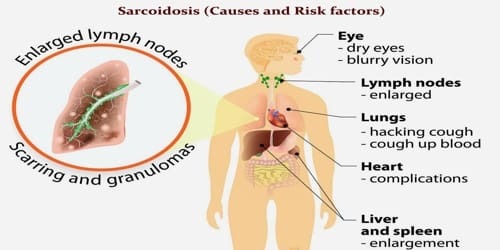 Definition: Sarcoidosis is an inflammatory disease that is the growth of tiny collections of inflammatory cells (granulomas) in different parts of our body, most commonly the lungs, lymph nodes, eyes, and skin. Any organ, however, can be affected. This causes organ inflammation. Sarcoidosis may be triggered by our body’s immune system responding to foreign substances, such as viruses, bacteria, or chemicals. The signs and symptoms depend on the organ involved. Often there are no, or only mild, symptoms. When it affects the lungs there may be wheezing, coughing, shortness of breath, or chest pain. Some may have Löfgren syndrome in which there is fever, large lymph nodes, arthritis, and a rash known as erythema nodosum. Diagnosis is suggested by the patient’s medical history, routine tests, a physical examination, and a chest X-ray. There is no cure for sarcoidosis, but most people do very well with little or only modest treatment. In half of the cases, sarcoidosis goes away on its own. In a few cases, however, sarcoidosis may last for years and may cause organ damage. 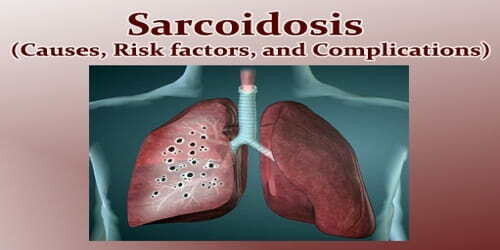 Causes and Risk factors of Sarcoidosis: The exact cause of sarcoidosis is unknown. Some people appear to have a genetic predisposition to develop the disease, which may be triggered by bacteria, viruses, dust or chemicals. There are no known predisposing risk factors for developing sarcoidosis. The immune system is complex. Basically, B lymphocytes make antibodies to fight against infections, while T-lymphocytes patrol the tissues to fight off invaders in other ways. Sarcoidosis rarely occurs in children. Symptoms usually appear in people between the ages of 20 and 40. Family history. If someone in their family has had sarcoidosis, they are more likely to develop the disease. Complications of Sarcoidosis: Most people who are diagnosed with sarcoidosis don’t experience complications. However, sarcoidosis can become a chronic, or long-term, condition. Lung infection. Untreated pulmonary sarcoidosis can lead to permanent scarring in our lungs, making it difficult to breathe. Heart. Granulomas in our heart can cause abnormal heart rhythms and other heart problems. In rare instances, this may lead to death. In rare cases, sarcoidosis causes severe heart and lung damage. If this occurs, people may need immunosuppressive medications.